As I press post tonight, it’s exactly a year since I spent my first night in a neurology ward at Royal North Shore Sydney, nearly 400km from home, attached a drip and wondering if I might experience a massive stroke and possibly die. That is exactly what the medical profession thought might be ‘my story’. The odds were stacked well and truly against me. It is a confronting experience and it does change you forever. And it’s not always a bad thing. Sorry to bore you but writing about the experience is cathartic – just as it was a year ago in hospital. I leave it behind and move onwards. So thank you for your patience. So what did I take from this year of recovery? It taught me about grace, fortitude and courage – right from the moment I heard “You need to understand that this injury has a significant mortality rate”. Even now I’m surprised at how calm I was. I don’t think my attitude saved me but it kept me calm as I told myself over and over… “this is not how my story ends”. When they wanted to take blood out of the veins in my feet or puncture the femoral artery in my thigh (OK that did terrify me! I silently recited the poetry of Dylan Thomas to distract myself – who knew a drunk Welsh poet could be so calming! ), I accepted it needed to happen. Like running any distance, I just had to keep going for it to end. I’ve learnt to embrace and conquer my anxiety. I’m the type that needs to resolutely go out there and fight my dragons with every weapon in my arsenal. I don’t face my dragons, I destroy them and then dance on their grave. If there was a mythical creature I have an affinity with, it is the phoenix – the creature that rises from the ashes of destruction. And while I’m not majestic like the fiery winged beast, I’ve often imagined myself rising above the injury, anxiety and leaving it behind. I’ve learnt to refuse to be defined by my injury, to ignore the demons that continually ask ‘what if’, to live in the moment, to write my own rules, to reject the drama of others, to turn away from negativity, to embrace joy. I celebrate what I can do rather than mourn the things I lost. I enjoy my running – and have run three half marathon events, my first trail run and most recently the infamous Sydney City 2 Surf in Sydney this year. I’ve clocked over 820kms in 2018 and am back to my former pace and that’s enough for me. I’ll never run a marathon. I’ve got the personality to – just perhaps not the carotid artery anymore. I’ve proved enough to myself and I’m happy. I run beyond medical advice but so far, I’m listening to my body and it’s working for me. The toughest thing I’ve ever made myself do! The run leg of a half ironman in the heat of day in May 2018… I did think for most of the distance “how so I explain this idiot choice to the specialist in November??”. This was my first event ‘back’ and it was horribly hard, hot and stressful – but I won back my confidence. Worth it. I hate the fear/worry my family lived, and probably live, with. I’ve accepted I can’t always be a pillar of strength – or do everything for everyone and I no longer want to. I’ve always been an exceptionally independent human being however I learnt that I am not an island. I need a village. I’m still highly selective about my village 😊 as I can no longer bear drama, nastiness, pettiness or unkindness. I’d love to tell you that it’s all been plain sailing but there’s been sadness and tears – however, surprisingly, very little anger. Bad things happen that you can’t control or change and that’s life – I see anger as being counterproductive to moving on and becoming stronger. I don’t think life is always about forgiveness, it can sometimes be about acceptance. l will have another brain/neck MRI in November… perhaps nothing has changed… or perhaps miraculously my artery has repaired itself and life resumes without the worries and restrictions. Realistically, I think that is not my future – I can’t believe the damage will ‘disappear’ – life isn’t always the fairytale you want it to be. I think my injury will always haunt me in some way. Who knows. I’m still here against the all the odds that were stacked against me 365 days ago. Whatever I’m made of, it’s tougher than any hockey ball. It’s been a simple decision to live every day. You could die any old unremarkable day… but you can choose to live every day. I choose to live. Now I’m off to finally finish that blog post about the Tessuti Monroe and Papercut Patterns Fall Turtlenecks. … and I’ve been sewing more dancewear – sorry, not sorry. If you are interested in trying Spoonflower – here’s a discount code Lizzy10 to receive 10% off your order – valid until 17 July 2018. When Spoonflower asked if I was interested in their fabric…. of course I said yes! I’d always been curious about this service and I know so have plenty of others. For those who don’t know what Spoonflower is… from their site: Spoonflower is the world’s first web-based service for custom, on-demand fabric creation, making it possible for individuals to design, print and sell their own fabric, wallpaper and gift wrap. So really the limit is your imagination – or wallet. I decided that I had more than enough clothes for myself – and thought it would be a unique opportunity to create something memorable and special for my youngest daughter Giselle. She’s not the dancer. She’s my crazy love girl: kooky, kind and funny as the day is long. While I could have chosen an existing design, I thought it would be more fun to try out the design element of the service as well – and to capture a moment of Giselle’s creativity and personality. I scanned in the doodle and loaded it to the Spoonflower site – incredibly fast and easy. I chose ‘dogwood denim’ which is a great heavy non-stretch woven fabric, perfect for bag making. I’ve paired it with a black non-stretch denim from the stash. This bag should last for YEARS. I love the selvedge on the fabric -complete with details. It’s almost like a old-fashioned silver hallmark. I was initially concerned about the tiling of the design and how to manage that in the project – however it turned out to be a dream to pattern match & made for some fun positioning on elements of the bag. Thank you so much Spoonflower! I do also have some matching fabric in the organic knit – so watch this space! I’d definitely make this again. In fact I know I will. Very easy to put together. The biggest barrier is finding the notions, d-rings etc. I still haven’t found any swivel-clips locally – hence no shoulder strap yet. Some of the cutting notes on my pattern pieces didn’t always specify to cut interfacing – however the cutting layout diagrams did. Regardless of this inconsistency, I think it is up to the individual to decide which pieces require interfacing, based on their fabric choice. The most challenging element of this project was simply the weight of the fabric and the size of the project. I’ve got the pieces cut out for the Dopp kit & travel pouch to go with these – however I ran out of time & am currently in Perth to run a half marathon relay leg in the Western Australian Marathon (about 4000kms from home). Home to sew soon! I really enjoyed this process and particularly enjoyed the smile it bought to Giselle’s face. A really special sewing project. Thank you Spoonflower. Fabric supplied by Spoonflower – all opinions my own. Looking for Australian Sewing Blogs to follow? Check out this list – surprised to find myself on there but delighted to see familiar & some new faces as well. Knitting… one of those endlessly therapeutic crafts… once you master it! I had the Sous Sous jumper in my Ravelry queue for quite some time, it looked quite complex, large and daunting. However when you keep coming back to something, at some point you either abandon it – or you rise to the challenge. It didn’t take me quite as long as expected – and it also wasn’t as difficult as I had imagined. It was a pleasure to knit with beautiful Madelinetosh Merino DK yarn and a gorgeous set of circular needles I received for Christmas. The front and back and knitted in two pieces. The shoulders are seamed and you pick up stitches to knit the sleeves. The side seams are then sewn… and it’s done! There is an enormous amount of moss stitch and the cables are quite simple once you get into the pattern. I did have issues with the sleeves. After ripping out my first sleeve attempt about four times, I just knitted in pattern in a way that made sense to me and that worked rather than following the pattern word for word. Very brief notes on Ravelry here. I’ve only steam blocked this. I think it will soften and relax again with a gentle wash and block later. I’m no knitting guru. Every project you learn something, gain more confidence, try something new. And every project I’m on YouTube deciphering and mastering a new technique! I’ve found Very Pink Knits on Youtube very helpful. Clear concise demonstrations of techniques. It is an unusual shape and I was slightly concerned when I finished that I may struggle to wear it. Turns out I love it. It’s a lovely casual layering piece, easy to slip on over everything and anything. Perfect for those in-between days when it’s neither cold or hot. If I had the time and patience I would be tempted to knit one in a few more colours! The back is large and weighty and I find the weight makes wants to slip backwards… but I love it enough to forgive it for that. However when you look at the back photos on the pattern itself, the shoulder seams are set over the back of shoulder. I originally thought I would like to change the front curved hem or raise the neckline – however I’m so glad I left the proportions as they are… for me, it just ‘works’ and has been worn quite a lot… in fact it’s perhaps my most loved thing I’ve ever made! I was so impressed with the design of this pattern that I purchased the Cable Source Book by Norah Gaughan. It’s an absolutely beautiful and detailed book which includes techniques and patterns – highly recommended to all the knitting people out there. Pattern: Sous Sous, Norah Gaughan on Ravelry here, purchased via Ravelry. Size: the smallest one – finished bust size 132cm or 51 inches. No affiliate links – purchase where you choose. I’m doing OK – thank you to those who send me lovely messages and check in on me. I’m running but not excessively. I run about 30kms a week. I don’t push myself too hard but somehow have taken a minute off my pre-accident 5km personal best (and my calves are getting too big for my long fitted boots and also my jeans LOL!). I have plenty of restrictions, no weights, no lifting anything above my head, rollercoasters, contact sports, painting ceilings, chiropractors and other things – things I can live with. Sometimes anxiety eats away at me – and I get sad or emotional – but that voice gets quieter as I leave ‘that day’ further behind. I managed to complete the run leg of a 70.3 Ironman in Port Macquarie about a month ago (that’s a 21.1km – or 13.1 mile – run), you read about it here. It wasn’t a stellar effort – running on a hot day at midday, about 26 degrees celsius, full sun and no breeze. I agree, it was perhaps not the smartest idea but it did go some way to restoring my faith in my physical abilities again. Next weekend I’m in Perth running in the Western Australian Marathon event. I have no intention to attempt a marathon until I’ve ‘passed’ an MRI or get some sort of clearance from the endovascular specialist – my next one isn’t until November. I’m just running another half marathon in a relay team with a lovely friend – who is running her first ever marathon. No stress. Just fun with friends. So let’s start by talking about the new Style Arc Ariana Dress. I sewed on the last button and photographed this in the evening in the final minutes of sunshine. It’s autumn here but still deliciously warm. This pattern was released last week. I have collected a couple of vintage patterns that are quite similar but for a variety of reasons, this one inspired me to sew immediately and so I did! Style Arc describes the pattern as follows: You will love this gorgeous button through sun dress. The bodice is beautifully fitted. The shaped bust seams and the shirred back allows this dress to fit perfectly and be comfortable to wear. The skirt has gathers falling from the waist and has two large patch pockets. Not after a dress? You can make this one as a midriff top too! This was only intended as a ‘test run’ version, I’ve often struggled through Style Arc patterns and instructions – and I wasn’t sure if I would like the style on me. So I raided my stash and came up with this lovely cotton/linen which seemed perfect for the task – and I’ve rather fallen in love with it! I purchased the PDF version, which only comes as an A4 print-at-home option. I contacted Lena of Iconic Patterns and she created two A0 pages from the pattern for $10 which I had printed at the copy shop – all done in less than 24 hours. Expensive solution but I was impatient and haven’t felt such an urge to sew for ages! I couldn’t bear to wait for a paper pattern in the post. Apparently Style Arc will provide an A0 file if you request it. Call me petulant but I don’t think you should have to ask for something which most other independent pattern designers now provide (thanks for listening Carolyn) or that they could provide but chose not to in the initial purchase. It’s absolutely Style Arc’s right to make that business decision but I’m also entitled not to like it. I chose to use resources available to me to be able to print it in an easy-to-use manner – as soon as possible! Thanks Lena. Style Arc Ariana Dress – lots of buttons… I think they cost me more than the fabric! Sparse at best! That said, Style Arc are notorious for their very brief instructions. If you can sew and have experience in different garment construction it’s not a bother – if you don’t … it is. So I would not recommend this pattern for beginners. I found the instructions were adequate but I think many might chose to do some things slightly differently. I found the instructions to attached the shirred panel to the bodice very brief and I figured out a way to do this by myself. I didn’t like how the bodice was attached to the skirt – or at least the way I read them. perhaps style Arc assume you will figure out the best way to do so – rather than giving you a method. The way the shirring panel was created meant I had to do some unpicking to obtain a neat result on the inside of the bodice. I sewed the skirt to the outer bodice and then slip stitched in the lining into place along the waistline. A shirred back panel. Easy to create IF you know how! If you are hoping to find detailed shirring instructions in this pattern – you won’t. There are some diagrams but they don’t actually tell you “how to shirr”. You need to figure that bit out by yourself. I have shirred before but if you are looking for helpful hints, this Craftsy post helps. Google and YouTube will be your sewing friends if you have never shirred before. Style Arc Ariana Dress – my shirring is not perfect but I only intended this to be a ‘test run’ and experimented a bit! I find it impossible shirr with my front-loading bobbin case fancy-pants Bernina. Instead I borrow my daughter’s basic Singer machine that has a top-loading bobbin. I hand-wind the shirring elastic onto the bobbin and increase the stitch length. 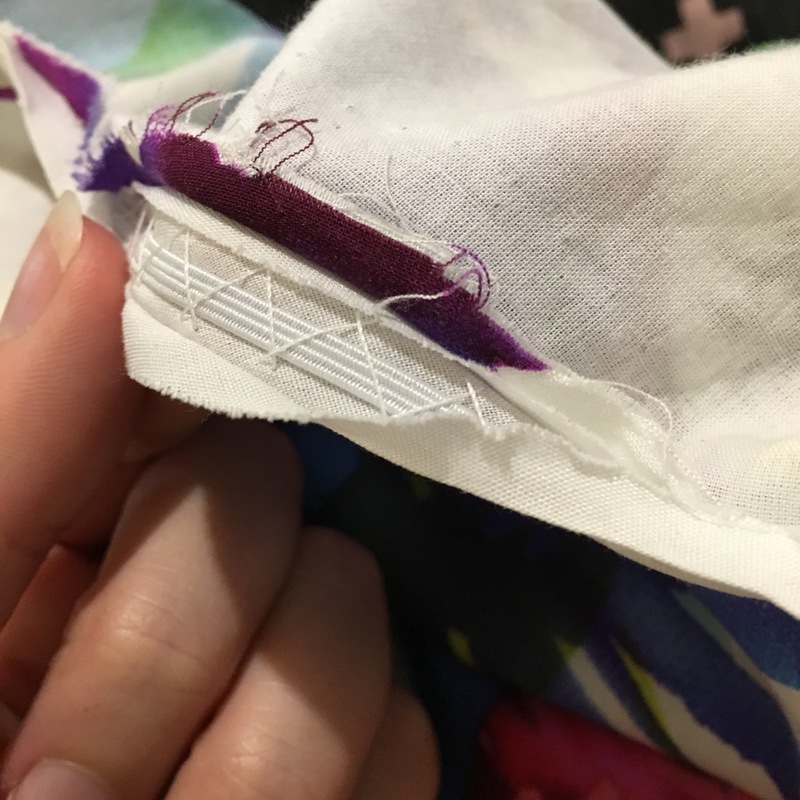 I also find gently providing some tension at the back of the fabric as it goes under the sewing foot helps pull the fabric and result in a more even and neat shirr. That said, I think the shirring experience varies vastly from machine to machine – do a test run first… the panel has 29 rows of shirring! It has large patch pockets however I didn’t have quite enough fabric to make pockets so I opted to leave them off. I think it would be a lovely feature in a solid linen. It’s very comfortable. Not too fitted on me but not a shapeless sack. Not too many pieces and quite quick to construct… if you can get yourself through the brief instructions and figure out a few construction issues. Some might be deterred by the shirring. However it is a narrow panel and it makes the bodice fit nicely. I like it. The bodice is fully lined. I chose to use the shell fabric as the lining. Many of the other patterns I have considered have a facing to finish the top edge. I think I might try one to see how it compares. I like the neckline shape and strap placement. Construction as per instructions. I would approach construction slightly differently next time around. A4 PDF pattern or a paper pattern and having to wait impatiently for delivery. I believe US customers can purchase copy shop PDFs from Amazon. Pattern: Style Arc Ariana Dress, can be purchased as a paper or PDF version. I sewed a straight size 6 with no alterations. Fabric: Cotton/Linen blend – Still available online – my piece was a remnant bin find for $12 for a 1.7m piece. I’ve been absent from ‘blog land’ for quite some time – for a range of reasons. As you can see, I’m still here and kicking despite last year’s massive health crisis. I’ve also sewn quite a few other garments and knitted a jumper… blog posts to come… sooner rather than later I hope. More about my damaged carotid artery adventures later. I’ve almost purchased the Mimi G Jessica Dress several times. At the moment Mimi G is giving away her Jessica Dress pattern which is quite similar to this dress in many ways. You do need to sign up to her database in order to receive an email to download a copy. I’m not sure how long this offer lasts for… so delay at your peril. It has bodice facings and the skirt button front is looks like it is finished differently. Busy Lizzie (another sewing blogger & friend) recently posted her Jessica Dress on instagram which she had added a shirred panel to. Bonus – gorgeous chevron stripe bodice! I downloaded this pattern today – it comes with an A0 option. I had a maxi wrap dress in my head… and here it is… Vogue 9251. This is a maxi length version of Vogue 9251 with flutter sleeves. The rayon fabric has lots of drape and is very fluid, even in a strong late afternoon breeze, it is a delight to wear. I finished this dress length midway between the midi and the maxi length on the Vogue pattern… I’m 5 foot 4 for reference. I underlined the bodice in white lawn. I d cured to do this after an Instagram comment from AnnaKatherine who has also sewn a dress in this fabric. It is a fine lightweight rayon and it is bearing a lot of weight in that long, long skirt and the fabric is slightly sheer. I used my Bernina rolled hem foot to hem the sleeves. I hand basted the bodice and underlining together and then used this fabulous technique to baste my bodice darts. This kept the fabrics together beautifully. Try it, it’s easy & very neat! I found this dress a little too roomy… I tried stitching elastic to the inside of bias tape finish on the neckline (I had to get creative as I’d trimmed the seams). This is a technique I picked up in a Claire Shaeffer couture book. I used it successfully on my Flora dress. Even with a tiniest bit of tension I didn’t like it. There’s a millions reasons this was a bad idea BUT it was fun trying it. I didn’t like it. So I unpicked it and tried something else. I strangely enjoy experimenting and trying new things, even when they don’t work. I unpicked the neckline again and then placed two small back neck darts in the neckline and this improved the fit. Thanks to the print you can’t really see those darts at all. I do wish that this pattern went down to a size 6. I love this dress and worn it a few times already. Yes, it’s a bright burst of colour… but it’s a dress that makes me feel happy and noone can argue with the virtue of happy wardrobe choices. Life: still fairly restricted activity wise but hanging in there… less than two weeks until my MRI and CT scans in Sydney. Hooray. Staying positive. Pattern: Vogue 9251. Size 8. Fabric: Rayon from Spotlight Australia. I bought the last of the roll at my store, last year. Sorry! Sometimes you just need to revisit a pattern because you love it so much the first time. You can find it over at Maaidesign blog. Maaike contacted me and asked if I was interested in writing a blog for her in return for some fabric… and although I have said no to a lot of things since my accident… an Australian business and lovely fabric seemed like a nice thing to blog about (I may have purchased some extra fabric because I liked it so much!). You can read more about it and see some more images over at Maaidesign blog.